Make yourself at home in one of the 90 air-conditioned rooms featuring minibars and LCD televisions. Your room comes with a pillowtop bed. Rooms have private balconies. Wireless Internet access (surcharge) is available to keep you connected. With a stay at Hotel Porto Dourado in Porto Seguro (Taperapua Beach), you'll be a 3-minute drive from Axe Moi Entertainment Complex and 7 minutes from Complexo de Lazer Toa Toa. 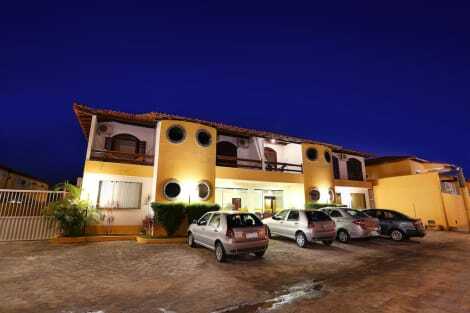 This hotel is 3.1 mi (5 km) from Muta Beach and 4.9 mi (7.8 km) from Coroa Vermelha Beach. With a stay at Sunshine Praia Hotel in Porto Seguro (Taperapua Beach), you'll be a 3-minute walk from Axe Moi Entertainment Complex and within a 5-minute drive of Complexo de Lazer Toa Toa. This beach hotel is 3 mi (4.8 km) from Muta Beach and 4.6 mi (7.4 km) from Porto Seguro Old City Center.